My grandfathers were an interesting pair. My dad's dad was a cranky guy who spent most of his time in the basement, working on various electrical doohickies, while my mom's dad was a cranky guy who spent most of his time in his legal office, trying to find ways to uphold the letter of the law while undermining its spirit. I thought of my grandfathers recently when I heard the story of John Webber of Taunton, England. While cleaning out his house, the 70-year old came across an old cup wrapped in tissue paper. He had put it away years earlier and had subsequently forgotten about it. The cup had been a gift from Webber's grandfather, a scrap merchant. 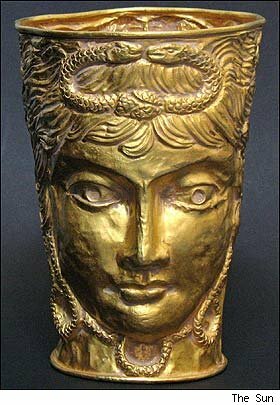 About 5 1/2 inches high, it was made of yellow metal and depicted a female face on either side. Although Webber had played with the toy as a kid, and had even used it as a target for his bb gun, he hadn't given it a good look in years. Wondering if it was worth anything, he took it to the British Museum to get appraised. Apparently, the cup, which Webber thought was made of brass, was in fact made of a single piece of 22-carat gold that had been pounded and sculpted into a cup shape. What's really interesting is when this pounding and sculpting originally happened: the cup is an artifact of the Persian empire and was made in the third or fourth century B.C. Webber has put the cup up for auction and expects it to fetch somewhere between $200,000 and $500,000. Bruce Watson is a freelance writer, blogger, and all-around cheapskate. His other grandfather gave him a lot of secondhand smoke and a weakness for PBR.